71% of all American adults use the Internet. 91% of all Internet users use a search engine to find information. Over 50% of all purchases are preceded by an Internet search. 30 percent of all search queries contain a city, state or zip code. There are 2.6 billion local searches a month. Although you don’t need a website, having one REALLY helps! People aren’t using Phone Books anymore. Phone books are functionally dead. 90% of people today use the Google Map to find a local business. You see all those little dots above on the map to the right? 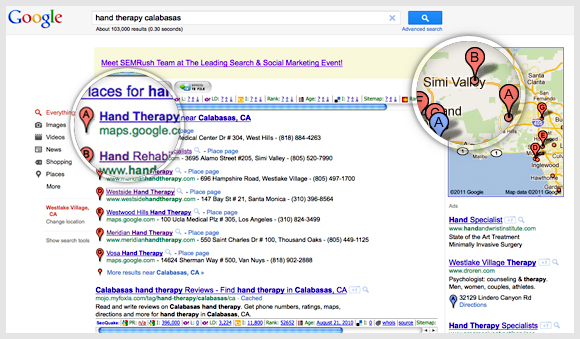 These are the only local businesses that are showing up on the first page of Google Local Search. We can help you get one of these listings and pages in Google. Better yet, we can further optimize and enhance these listings. This will help you dominate your competition by coming up in Local Searches and setting you apart with your enhanced/optimized listings. When customers search in your area for your type of business, you will be there front and center! When you fuse Google local search and your existing website together, you’ll gain even more “Google Juice”. Suddenly, you are head and shoulders above your competitors. You can run Local Search Engine Optimization on your website so that you come up in the top of searches for the terms your customers would be typing into Google to find you. If you don’t currently have a website, we can create one for you. This is both cost-effective and highly effective. Though SEO can take more time and effort (depending on the strength and competition of your market), you can literally create a constant stream of customers that are like a tap you can’t shut off. Local Marketing tends to be fairly easy to conquer these days, but note it will only get more difficult, expensive, and take more time the longer you wait to jump in. To learn more about how to leverage Local SEO, see our page here on Search Engine Optimization. 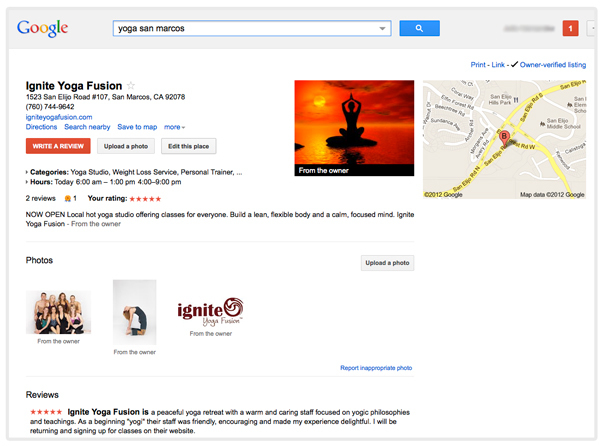 When you fuse Google Local Search and Mobile together MAGIC happens! You get a rush of new customers, and your old customers spend more money with you and come in more often. To learn more about how you can put mobile to work for you, see our page here on mobile marketing. Compared to any other form of customer acquisition, it’s cheap and extremely effective. As a business owner, you’re likely already in the yellow pages. If not, ask your dry cleaner, or your dentist, or your attorney what they are paying for the yellow pages. In most cases it’s tens of thousands of dollars a year to run a decent sized ad; and they know the yellow pages do not work anymore – it’s just what they have always been doing. So it’s not about spending more money, it’s just about redirecting some of the marketing. Why does it work so well? One word: VALUE! You can contact your customers in multiple ways. Get your customers to visit more often. Get your customers to refer you. Tie-in mobile and social media. Reward customers for loyalty with mobile. Fill up slow days with SMS. Seasonal and Holiday promotion ideas. Cash in on mobile coupons. Draw in customer’s friends with 4 Square and Facebook. Setting up your local listings in Google+, Yahoo Local, Bing and 47 others. Making sure all the elements are there (photos, citations, reviews, etc.) to get top placement. Ongoing Google+ Business Page monitoring and management. Setting up and promoting coupons for Local Listings. Setting up Facebook Places Page. Setting up E-mail marketing autoresponder sequences. Timing is EVERYTHING and the time is NOW. When the time is right, success comes very easy and when that window passes, things become hard again. You do not want to be left behind this fast moving train when it takes off. So, whether you’re brand new or you already have an established online business, we will help you be that “edge” you need to succeed in these more difficult and turbulent times.